In 2005, Mr. Tony Cosby, Sisters High School Computer and Construction Teacher, wanted a class that would motivate his advanced students. He felt that a guitar class would be a perfect fit. 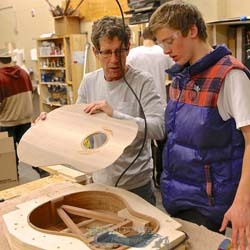 In Woodworking II, students work throughout the whole trimester constructing guitars. Working with the help of one of the best Luthiers (guitar makers) in the northwest, Jayson Bowerman (Breedlove Guitars), they have been able to produce 30 guitars per year. After the students complete their guitars, they are given the choice to keep their guitar or sell them with the school's help. Many students that choose to keep their guitars, continue to use them to learn to play traditional folk music in the Sisters High School Americana class. Others dontate their guitars to raise funds for school programming. Click here to be re-directed to the Sisters High School Woods Program website to learn more.